Where did it come from? Free Kindle download. Summary: Catherine Morland is an average girl from a large family, not particularly pretty or bright or well-connected. But she is an avid reader of novels, and when she is invited to accompany some friends of the family to a season in Bath, she is sure that the adventure of which she is the heroine is sure to begin. She soon meets a young lady, Isabella Thorpe, whose brother is friends with Catherine’s elder brother, and they become fast friends. She is also introduced to Mr. Henry Tilney, a charming and agreeable young man, to whom she becomes quite attached. 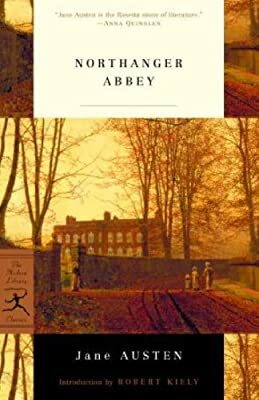 To make things even better, Henry’s family lives in an enormous ancient abbey – exactly the kind of place featured in the novels that fire Catherine’s imagination. But Catherine will soon learn that imagination can go too far, and that the horrors of hypocrisy, selfishness, and pride are far worse – and far more prevalent – than any of the horrors contained in her beloved novels. Review: I enjoyed Northanger Abbey quite a bit – it’s too funny not to – although I thought that it didn’t quite have the weight of the other Austen novels that I’ve read. It’s in large part a parody of the Gothic novels of the day (I haven’t read The Mysteries of Udolpho, which features heavily, but I think The Castle of Otranto gave me a good enough idea), but even without being familiar with the source material, there’s enough about books and readers in general that it should be fun for any bibliophile. I was surprised, though – it’s a lot more tongue-in-cheek than I was expecting, even compared to Austen’s other novels, and not at all shy about poking fun both at its characters and at the elements of the real world that inspired them. But, while I enjoyed this book overall, I didn’t get quite as involved with it as I have with the other Austen novels I’ve read. I think that it’s in large part because Catherine is so naïve that it was hard for me to really empathize with her, or even take her entirely seriously. I understand that her naiveté and subsequent character growth is the main point of the novel, but at the same time, I found her blindness to the motivations of others to get very exasperating very quickly. I also was not particularly caught up in the romance; Mr. Tilney’s a fine leading man, but there wasn’t enough urgency or passion to the relationship to really get me involved. All the same, it was a fun read – and I do mean read. I typically prefer to listen to the classics, because I oftentimes have an easier time absorbing the prose through my ear than through my eye, but in this case, I found that the prose read perfectly smoothly, and faster than I was expecting. I don’t know if it actually is easier prose than some of Austen’s other novels, or if I’m just growing up as a reader, but I suspect it’s the latter… something of which Ms. Morland would surely approve. 4 out of 5 stars. Recommendation: While I didn’t love it on the same level as I did Pride and Prejudice or Persuasion, it was certainly an enjoyable read, and one that should definitely be on the list of any bibliophile. First Line: No one who had ever seen Catherine Morland in her infancy would have supposed her born to be an heroine. Location 318: “…Mrs. Allen had no similar information to give, no similar tripumphs to press on the unwilling and unbelieving ear of her friend, and was forced to sit and appear to listen to all these maternal effusions, consoling herself, however, with the discovery, which her keen eye soon made, that the lace on Mrs. Thorpe’s pelisse was not half so handsome as that on her own.” – a woman’s long cloak with slits for the arms. Location 537: “… he, being of a very amiable disposition, and sincerely attached to her, gave every proof on his side of equal satisfaction, which he could have leisure to do, while the bright eyes of Miss Thorpe were incessantly challenging his notice; and to her his devoirs were speedily paid…” – respects or compliments. Location 1042: “Catherine knew all this very well; her great aunt had read her a lecture on the subject only the Christmas before; and yet she lay awake ten minutes on Wednesday night debating between her spotted and her tamboured muslin, and nothing but the shortness of the time prevented her buying a new one for the evening.” – embroidered on a circular frame. Location 1046: “I would be mortifying to the feelings of many ladies, could they be made to understand how little the heart of man is affected by what is costly or new in their attire; how little it is biased by the texture of their muslin, and how unsusceptible of peculiar tenderness towards the spotted, the sprigged, the mull, or the jackonet.” – a soft, thin muslin; a cotton fabric of light weight, usually finished as cambric, lawn, organdy, voile, etc. Location 1797: ““I remember too, Miss Andrews drank tea with us that evening, and wore her pucecoloured sarsenet; and she looked so heavenly that I thought your brother must certainly fall in love with her; I could not sleep a wink all right for thinking of it.”” – a fine, soft fabric, often of silk, made in plain or twill weave and used especially for linings. Location 2443: “The breeze had not seemed to waft the sighs of the murdered to her; it had wafted nothing worse than a thick mizzling rain; and having given a good shake to her habit, she was ready to be shown into the common drawing-room, and capable of considering where she was.” – to rain in fine drops; drizzle; mist. Location 2544: “It was not absolutely ebony and gold; but it was japan, black and yellow japan of the handsomest kind; and as she held her candle, the yellow had very much the effect of gold” – a hard black glossy lacquer. Location 2663: “The netting-box, just leisurely drawn forth, was closed with joyful haste, and she was ready to attend him in a moment.” – a sewing box. Location 2884: “Catherine had read too much not to be perfectly aware of the ease with which a waxen figure might be introduced, and a supposititious funeral carried on.” – fraudulently substituted or pretended; spurious; not genuine. Location 3743: “…confessed himself to have been totally mistaken in his opinion of their circumstances and character, misled by the rhodomontade of his friend a man of substance and credit, whereas the transactions of the two or three last weeks proved him to be neither…”” – vainglorious boasting or bragging; pretentious, blustering talk. ← Spring Read-a-thon ’11: The Big, Fancy, Frequently-Updated Post! I’m so glad you enjoyed this one—I think it’s my favorite, although I’ve a professor who pokes fun at me because it’s so thin. Omni – Pshaw to your professor! Most of my favorite books are thin. Although this isn’t my favorite Austen, it’s nothing to do with the length. I am not sure what it is, but I am not a big Austen fan. I find the romance-type classics I have enjoyed are a bit gothic in nature. I haven’t read this one, though. I really need to reread this one. It has been awhile! It seems a bit cliche, but Austen is definitely one of my favorite authors. Lola – Nothing cliche about it, Austen is well-deserving of being a favorite. I’m very under read when it comes to Austen and I really should remedy it. I’ll have to check for free e-books. Kathy – They’re all available free! It’s a good way to get caught up. I had no idea that this one was satirical in nature and it’s been sitting on my shelf for years. I love P&P and definitely need to read more of her books. Alyce – Yup! This one read surprisingly quickly; definitely give it a shot! Being an Austenesque author, I’ve read NA at least three times. While it’s not my favorite Jane Austen, it has a certain charm all it’s own. I DID read The Mysteries of Udolpho, by the way – kind of a long, tough slog, and contrary to what Henry Tilney said, I didn’t feel my hair stand on end even once! PS – Thanks for the vocab words – a nice added touch. Shannon – I’ve got The Mysteries of Udolpho on my Kindle, but after The Castle of Otranto, I’ve been a little bit leery. I liked this one and found it a bit easier than the other Austen novels I’ve read (didn’t like it quite as well, though). Definitely made me want to pick up some gothic novels, though! Trish – Have how found any good gothic novels to recommend? I enjoyed this book, too. I agree that it doesn’t top Persuasion (my all-time favorite book) or P&P, but it’s funny and worth reading. I enjoyed this one too (review on my blog), it’s got some more bite to it than P&P! But reading Northanger Abbey after Mysteries of Udolpho is so very, very rewarding. this seems like a good book . i probably might read it but i’m not that much of a Jane Auesten fan.